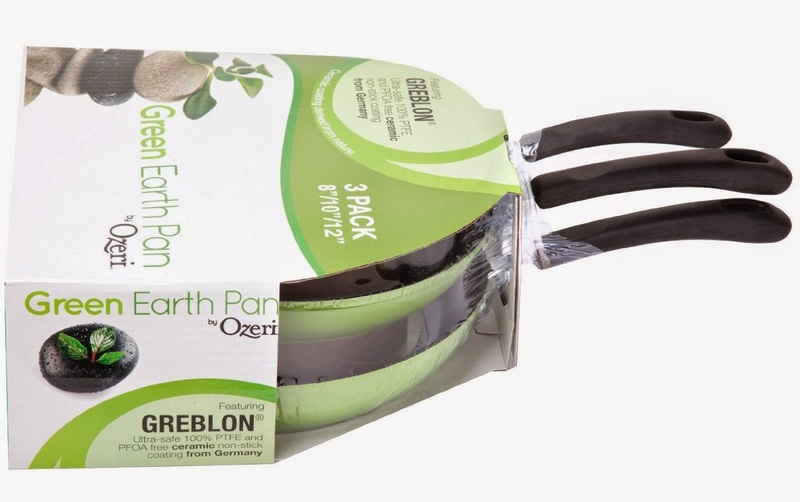 Top Notch Material: The 10" Green Earth Frying Pan by Ozeri, with Smooth Ceramic Non-Stick Coating- Our New Favorite! The 10" Green Earth Frying Pan by Ozeri, with Smooth Ceramic Non-Stick Coating- Our New Favorite! Around here, we are huge Ozeri fans and I am just in love with the 10" Green Earth Frying pan they sent!! First off, this pan is pretty heavy duty and fries evenly. It is also large enough to cook our entire dinner in one pan instead of frying some, and the adding more. It is a time saver for me, and it is also good for my family. How is it good for my family you might ask? Well, you see, many traditional pans are coated with something called PTFE, and when PTFE is heated up, it can be toxic to small animals and birds. I fully believe this because years ago, I had a rescue bird in my very small apartment. One day he just started having seizures and died. The ONLY explanation of this is that he was so close to the kitchen where I had fried with a traditional frying pan. Since we now have more birds and other small animals, and more importantly SMALL children, I want to cut this harmful chemical out of our lives completely. This pan fries beautifully. We have since retired all our other pans that we had, and plan on purchasing the full set from Ozeri. Our other pans did not fry evenly, and burnt parts of our meat or veggies, but that is not the case with this pan. It is a very solid, heavy weight pan that does not scratch easily. Nothing sticks to this pan, and we have another Ozeri pan (12") that we have used for months now, that is still in excellent shape! I am convinced that long term, this pan will stay in good working order, and continue to be a favorite of mine for a long time.